It can be easy to lose track of time in college. So easy that you can even forget what day it is! With our Anya Monthly Calender stuck to your college dorm room's walls you'll always be able to keep track of time. The pretty floral liner of our Peel N Stick Calender will add dorm room decoration to your college space. Keep our calender next to your dorm bed or desk so that you'll always know what's on your schedule. Our dorm calender also comes with a dry erase marker so you can start filing it up right when you get to your dorm room on move-in day. 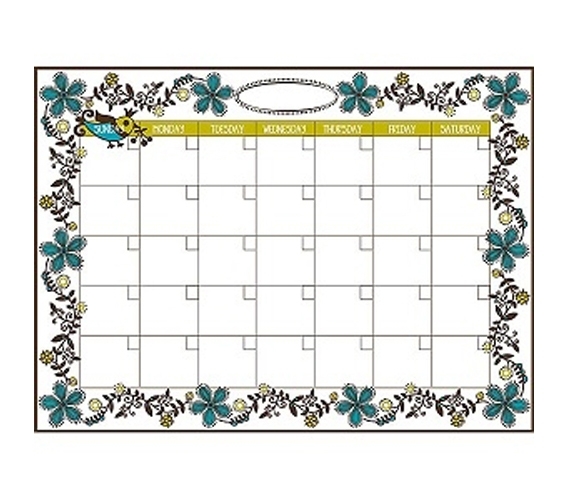 With dimensions of 13'' x 17.75'', our dorm calender will fit perfectly on any of your dorm room walls. It's so important to have a calender in your college dorm room, especially during finals week! Keeping a schedule and looking ahead to when all of your finals are makes taking your exams so much easier. Our dorm wall calender is also 100% dorm wall safe and guaranteed not to leave behind any residue or scratches. So save the date and never miss an appointment with our cute Anya Monthly dorm wall Calender.